Updated May 21, 2010 with addendum at end. Just earlier this week and despite vocal opposition from a handful of politicians and residents, Toronto Public Works Committee councillors approved a summer pilot for separated bike lanes on University Avenue, a major 8-lane arterial road in middle of downtown Toronto. Yes, it is 8 lanes wide. Final approval should occur at the Toronto City Council meeting on May 11 and 12. Proposed Separated Bike Lanes. University Ave. facing north towards Queen's Park, Ontario legislative buildings. Toronto, ON. 2010. Mock-up illustrates one of the proposed options for pilot implementation. Photo from City of Toronto Report Apr. 2010. The alignment of the proposed bike lanes would make good use of the wide, people-scaled centre median running along University Ave. The median is populated with art, statues, benches, trees and flower gardens. The proposed 1-km. long separated bike lanes from Queen St to College St. would reduce University Ave. to 3 car lanes in each direction. It will be the first separated bike lane in Toronto. University Ave. cuts across several east-west bike streets with bike lanes which are well-used by cyclists. This street is well serviced with the Yonge – University – Spadina subway line and its closely-spaced stations leading to underground retail shopping malls thus minimizing the need for surface bus routes. Within a dense workforce corridor, several large hospitals, financial institutions, courthouses and high-rise corporate head offices line the street. Once a sterile street void of people after the sunset, high-rise residential housing is making its gradual appearance. 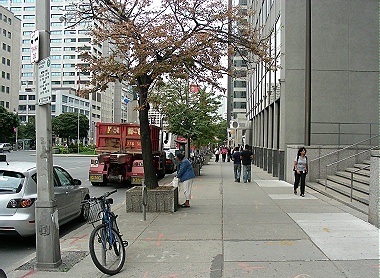 As a North American city, Toronto is distinctive where it has always maintained an important residential component to its make-up in the downtown core. Over the years, this component has been strengthened with conversion of a few office building to include residential units. When Jean cycle-commuted to work from Scarborough into downtown Toronto for several years, University Ave. was handy. The pavement was smooth for cycling and there were less bus interruptions. On the other hand, car speed was and probably still is fast. During the work day, there were pedestrians streaming from subway stations, buildings and the feeder streets. However at night, University Ave. was void of pedestrians and street life. Cars zoomed along but clearly not in the great numbers as during the day — typical of a business district area. However pedestrians did walk along intersecting streets after work hours on their way to a subway station for other destinations in the entertainment or shopping districts. Separated bike lanes could help rebalance overall road usage at all hours of the day and night, calm traffic and increase safety for both cyclists and pedestrians. As a pedestrian, I do remember several times nearly running across University Ave. just to make the crossing on one traffic signal. Separated bike lanes could also allow safe cycling for parents with children within downtown. At this time, there are no child protected cycling facilities in downtown Toronto except for the Waterfront Trail sections and in the ravine bike trails system. Just like Toronto, lack of protected cycling routes for children, is also true in downtown Vancouver except for sections of the 30-km. Seaside-Seawall bike path. This trial will be quite different from Vancouver’s Burrard Bridge or Dunsmuir Viaduct separated bike lanes into downtown. If successful, separated bike lanes could, once more, humanize and bring back more Toronto pedestrians along University Ave. and even create, gasp, more demand for on-street cafes, and social meeting spaces. Vancouver is also planning new separated bike lanes for this year, by extending the lanes on the Dunsmuir Viaduct and the Burrard Bridge into the downtown core. 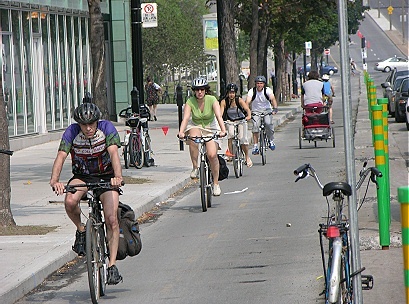 Of course, Montreal cyclists have been enjoying their separated bike lanes for years with a network leading from the suburbs into the downtown core and into Old Montreal. With separated bike lanes being installed this summer both in Toronto and Vancouver, we have two different laboratories for observing the contribution of cycling and car separation within downtown cores for growing cycling traffic volumes. City of Toronto. Protected Bike Lane Pilot : University Avenue and Queens Park Crescent Project. Presentation to the Public Works and Infrastructure Committee. Apr. 20, 2010. Document includes photo examples of separated bike lanes in other cities worldwide. James, Royson. “James: Stop and Smell the Lilies”. In Toronto Star, Apr. 24, 2010. Shepherd, Jeremy. “City Considers More Bike Lanes.” In Vancouver Courier, Apr. 23, 2010. On May 12, 2010, Toronto city council did not approve the pilot University Avenue separated bike lanes. However their first Bixi public bike rental program was approved the day before by council. On May 20, 2010, Vancouver city council approved extension of the Dunsmuir separated bike lane into downtown Vancouver. Projected completion for this 6-month trial, is expected to be June 15, 2010. Thanks for the outside perspective on Smogtown. This idea didn’t quite happen by one vote; Dan Leckie was likely rolling over in his grave. But some of us TO cyclists were less keen on having the bike space near the median vs. curbside, and as the dominant travel demand is east-west, and as it’s still under-served/provided, the political will should be applied to Richmond/Adelaide (finally), or to Queen or King.